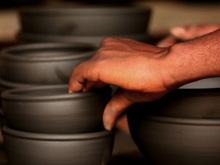 Get started with ceramics and pottery or expand your sculpting passion with Dragon Fire Ceramics. For mobile users to find info about upcoming classes hit the navigate button, then choose EVENTS. For PCs and laptops just go to EVENTS. Whether looking to learn or further your skills and technique, our studio, located in Wrenshall, Minnesota, is the perfect place for all your needs. Our furnished workspace is fully equipped to handle all major techniques. Our professional and experienced team is available to help you with developing and growing your skills. We have regular classes as well as children’s workshops to get the next generation involved and passionate about pottery. We also hold fun-filled activity parties, a great option for a girls’ night out, a date night or birthday party. If you’re just looking for inspiration or a new fixture for your home, we’ve got you covered, as well. We offer a selection of ceramic pottery, tiling and sculptures for purchase, handmade by our staff artisans and studio members. Come on down and take a look, get your hands dirty, or just learn more about the exciting opportunities to get involved with decorative pottery. For more information, give us a call today at 218-384-9374 or email us at dragonfireceramics@yahoo.com.